"You remind me of the babe. What babe? babe with the power. What power? power of voodoo. Who do? you do. Do what? remind me of the babe." Even though these are the lyrics David Bowie wrote, sometimes the word "hoodoo" is substituted for "voodoo" by whomever is singing them. Hoodoo? Why Goblin Valley State Park of course; thousands of hoodoos make the landscape of this park resemble an alien world. 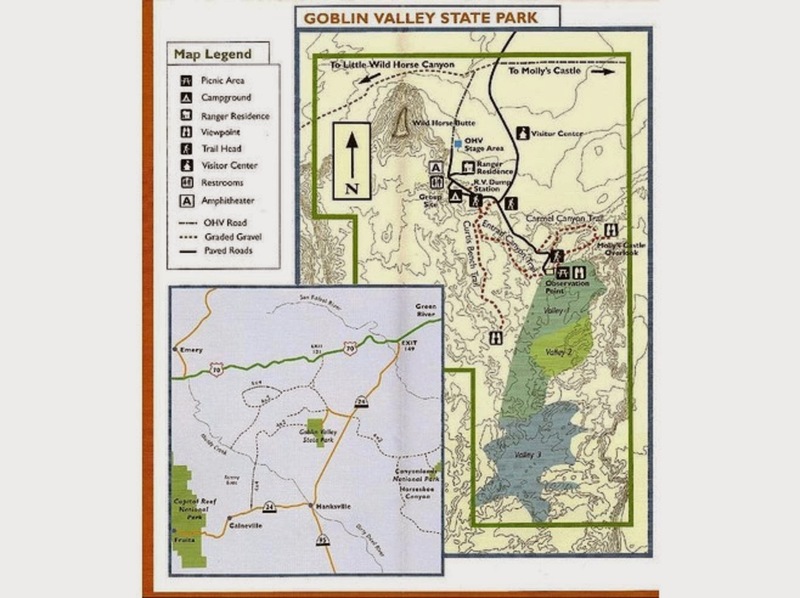 Unfortunately this prehistoric playground of goblin formations has come into the news (October 2013) due to the destructive nature of three people. I really do not want to refer to them as "men" as that would be insulting, in my eyes, to the entire male half of the human species. These "things" pretended to represent the Boy Scouts of America as leaders; they were supposed to teach their charges about nature, conservation and respect for the planet. Instead they decided to teach the boys under their care to destroy what nature had formed over millions of years. Though these "things" were dismissed from the Boy Scouts, they should be seriously fined and most certainly given jail time; this is my personal opinion about the entire issue. Unless you have been living under a rock, no pun intended, here is a link to the story (with video) on CNN: http://www.cnn.com/2013/10/21/us/utah-boulder-boy-scouts/ , and this photo I'm posting was taken in April 2012 and could be the very formation that was destroyed. Alright then, lets get back to the park; Roy and I visited in April 2012, spent three hours climbing over, under, around, through these marvelous formations and had so much fun! It is definitely a playground for young and old alike and should not be missed when driving on Route 24, whether to or from Green River, in Emery County. The Entrada sandstone dates back 170 million years (Jurassic Period); evidence points to the formations being created by the tidal flows of a sea, rather than just the weather elements alone. 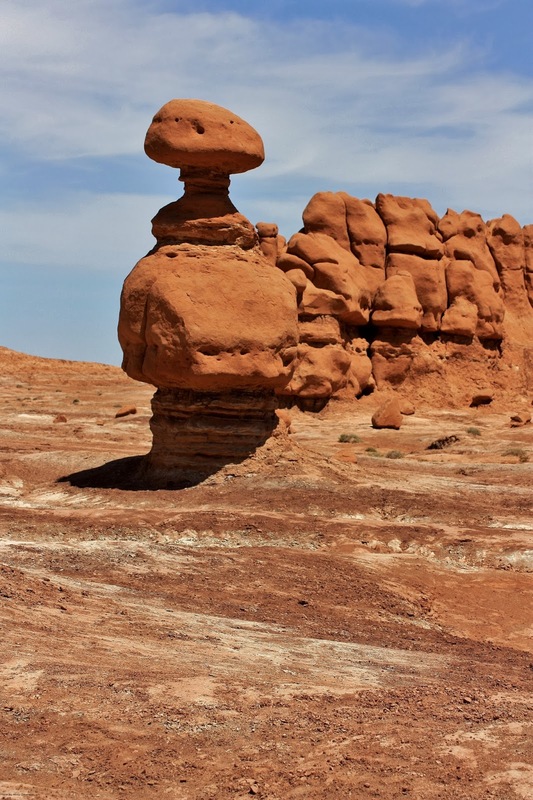 The term "hoodoo" refers to the mushroom shape of many of the formations; a free standing pinnacle with an overhanging cap. The term "goblin" refers to the spirited, whimsical, perhaps even malign forms of many; I even found one that resembled a whale. I usually don't post photos that have people in them, but I will today as I want you to get a good perspective on the sizes of many of these hoodoos. This is a playground where the goblins form little tunnels that an adult can crawl through, not recommended if you don't like spiders, and they can form an excellent framework for photos...the sandstone formations that is, not the spiders. Take a walk towards the Carmel Canyon Trail and Molly's Castle Overlook; it's an outstanding scene! 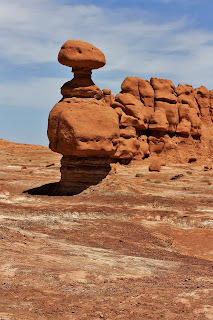 Goblin Valley State Park, I don't know how anyone could not have fun here; no matter what age you are, as soon as you see those hoodoos, you will want to play! Go play, have fun, and appreciate what the natural elements have given you. Not tired yet after being at a prehistoric playground? 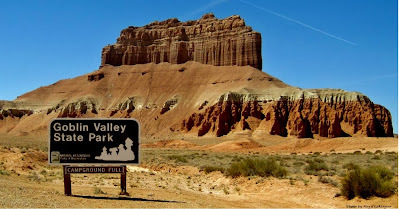 Hope you brought a picnic meal and then after that go work it off at Little Wild Horse Canyon; just follow the sign once you leave Goblin Valley State Park. Carpe Diem!!! Seize the Day!!! Only Thing Flat in Sand Flats is the Road. Oh Swell, the San Rafael Reef. World War 2 Leaves its Mark on Moab. White Rock to Big Indian on Lisbon Valley Road. It's Getting Colder, but 4-Wheeling is Still Hot. The Monument Valley Tour Begins. Baby Rocks and Volcanic Plugs in Arizona. Thompson Springs, a Mostly Ghost Town. The Autumn Season at Mesa Verde.